In December 2016 Baja Tattoo add a new laser tattoo removal machine. After numerous requests from local and international clients a new tattoo laser machine was purchased. 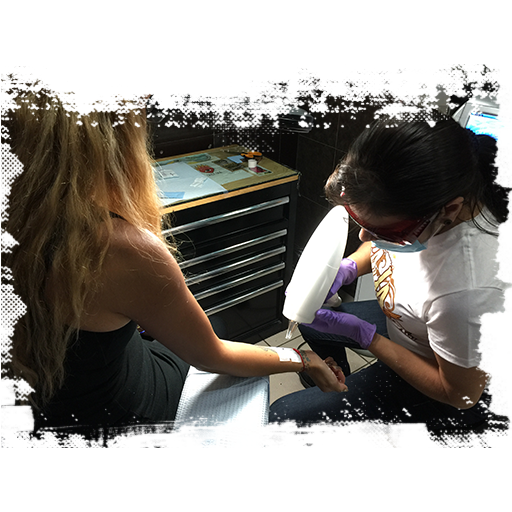 Baja Tattoo has the ability to remove any size tattoo from your body over a series of sessions. Prices range based on the size, condition, and colors to be removed. Call Baja Tattoo or contact us online to learn more about laser tattoo removal. Q: How much does it cost for laser tattoo removal at Baja Tattoo? A: This depends on a number of factors. We need to see your tattoo, the condition, the colors, size, and skin condition to determine the number of sessions we think it would take. We price based on those factors. Please come in for a personal consultation. Q: What machine do you use? A: After testing several models we purchased a Clinic Nd Yag Laser Tattoo Removal Machine. ND:YAG is the abbreviation of Neodymium:yttrium-Aluminum-Garnet. Q: How does laser tattoo removal work? A: Laser tattoo removal is based on the light blasting principle. The laser emits high energy instantaneously, which treat on the pigmented skin areas with a particular wavelength, and the abnormal pigmentations absorbs the powerful laser energy, part of them will break up into tiny particles which will come out of epidermis at once, the others will be licked up by macrophage, then eliminated from body through the metabolism. Q: Does the tattoo really come off? A: Yes, however, it all depends on size, colors, deepness of tattoo, the age of tattoo, skin type, etc. that will determine how many sessions will be needed to remove your tattoo. Q: What condition will my skin be in after a laser treatment? A: It is different for everyone. There is usually redness and some inflammation that will disappear after 24-48 hours. Aftercare is similar to a fresh tattoo – special ointments and it is to remain covered for a period of time, now swimming or sun as well. Q: Does a laser tattoo removal hurt? What does it feel like? A: Everyone is different however, most say it feels similar to being snapped lightly with a rubber band. Q: Can I get a tattoo on top of the area after you remove the old tattoo with a laser? A: Yes, but only after it has healed properly and your tattoo artist determines it is ready for the new tattoo that you want to get. Q: What is the aftercare for laser tattoo removal? A: For 24 hours after laser tattoo removal it is recommended to use a cold compress to reduce inflammation. It is advised that you should avoid extreme physical activity, hot showers, and saunas. A hustle butter ointment should be applied, as needed for 3 days following laser tattoo removal. For the following 2 weeks, direct sunlight exposure should be avoided as well as hot tubs, pool water, and salt water until the tattoo area is healed. Some scabbing, blistering, light bleeding and itching may occur. Immediately after treatment, there may be redness and swelling at the laser-treated site. This can last for a few hours after the treatment. Redness can last for 7-10 days; if blistering do not pop any blisters. Continue to apply one of the recommended ointments until the blister has popped naturally. Do not pick at or remove any scabs that may form as this could result in infection. You may take Tylenol to help with any discomfort but avoid aspirin, ibuprofen, and naproxen because they can increase the risk of bleeding and bruising. Shaving should be avoided in the treated areas until it is completely healed. Massage the treated areas daily for 5-10 minutes to help. Drink lots of water.